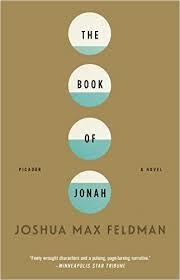 a book chick: "The Book of Jonah"
my take: In this is a modern re-telling of the Biblical book, Tarshish and Ninevah are replaced with New York City, Amsterdam, and Las Vegas and littered with iPhones, emails, and marijuana. Our unlikely hero, Jonah, is stringing-along two women, poised to do some dirty work to make partner at a law firm, and suddenly having strange visions. What's a guy to do? From the visions he gets the vague idea he should do something good. Excellent writing with handy chapter titles (inserted in the text) allow the reader to follow the Bible story if the story isn't obvious. "He'd been looking at the face of his iPhone as he had these thoughts, staring absently at the announcement of Sylvia's Incoming Call -- and when this announcement vanished, he found himself studying the screen more closely, peering into the device's little pixilated world. It was so quaint, so tidy, so hopeful in its way: the time across the top in sturdy, soothing Helvetic, the pictogram icons for maps, for messages, for games -- whatever you might need to get you through your day. This was, it occurred to him, another version of the puff-clouded heaven with the rosy-cheeked angels that it gave people such comfort to see depicted -- to believe in. This was the version that had given him comfort." Our book club discussed for a long time. We found the end a bit unsatisfying, but the beginning and middle made up for it. my source: Book Chicks January pick getting ready for the Festival of Faith and Writing @ Calvin College in April ... interesting to note that the story of Jonah is told in Judaism, Christianity, and Islam.